This female pit bull, dubbed Polly, was found near death Monday near the Humane Society of Hobart. Happy Tails Rescue Inc. of Munster is raising funds for the dog's care. This female pit bull, dubbed Polly, was found near death two years ago near the Humane Society of Hobart. Happy Tails Rescue Inc., of Munster, raised funds for the dog's care. The city of Hobart just raised its monthly stipend to the Humane Society for its work with stray animals and cooperation with the Police and Fire departments. MUNSTER | Emily Koskela was working Monday at the Humane Society of Hobart when a woman came in with a dog near death. Koskela said a woman entered the shelter at 2054 E. Ind. 130 that afternoon saying she found a pit bull just down the road. The dog could not stand and had pressure sores and yellow stains on her body, likely from lying in her own urine. The female dog, which was later dubbed Polly, was cold, dehydrated and severely malnourished, Koskela said. Humane society staff members began efforts to warm the dog and quickly contacted the Munster-based Happy Tails Rescue Inc. for help. "She wasn't here for more than two hours," Koskela said. Emily Halgrimson, who runs Happy Tails, said she went to the shelter to pick Polly up around 1 p.m.
"She was so cold her temperature didn't register on the thermometer," Halgrimson said. "She only weighed 19.7 pounds." Female pit bulls generally weigh at least twice that much. Halgrimson, who has been involved in rescuing dogs for five years, said she has seen some dogs in bad shape in the past, but Polly's condition was startling. "You don't get much worse," Halgrimson said. Halgrimson took Polly to the Westchester Animal Clinic in Chesterton to be treated by Dr. Larry Reed. Staff members at the clinic told her they were not sure Polly would make it through the night. Carlie Zona, who works at the clinic, said Wednesday the staff there was working to keep Polly hydrated and warm. Her temperature, Zona said, has increased slightly. 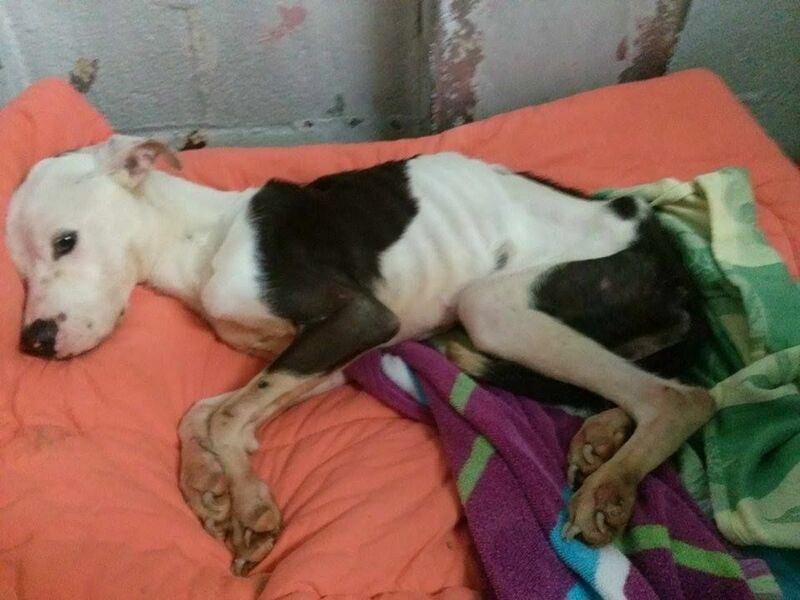 Polly, whose approximate age remains unknown, is unable to tolerate much food and was accepting small amounts from the hands of the clinic staff Wednesday, Zona said. The clinic also was administering antibiotics and vitamins as part of its care regimen. "She's definitely a very sweet dog," Zona said. "She looks like she finally feels safe." Zona said Polly still is unable to stand or raise her head for more than a few seconds, but wags her tail and can move her head from side to side. Zona said Polly remained "very critical" early Wednesday afternoon and that her chances of survival are about 50/50. "She really is one of the worst cases I've seen," Zona said. "One of the receptionists who has worked here for eight years or so said she's definitely the worst she's seen." Happy Tails is began raising funds online for Polly's care online on Monday with the goal of raising $1,500. As of Wednesday morning, donations exceeded $1,900 and were continuing to come in. "It's so incredibly overwhelming," Halgrimson said. "People really do care and want to help." Happy Tails Rescue Inc. is raising funds to provide for Polly's care. Anyone wishing to donate or learn more may do so at www.youcaring.com/happy-tails-rescue-inc-453862. Happy Tails is also seeking applicants to foster Polly. Applications are being accepted online at www.happytailsrescueinc.org/foster-a-dog. HIGHLAND | Days, weeks and months passed, and the tone of the posts on the "Help Us Find Carter" Facebook page faded. 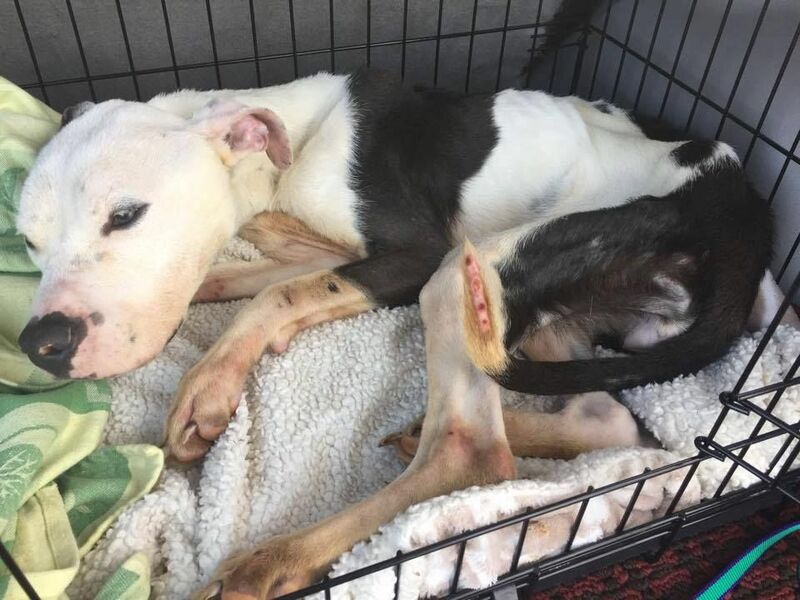 A dog who was rescued from the side of a Hobart road on Monday near death is improving, rescue workers entrusted with her care said Friday.